Chlorophytum comosum (Spider plant) is a plant that is native to tropical and southern Africa. The Spider plant is one of the most popular indoor house plants because they are very easy to care for.They enjoy indirect sunlight because midday sun may scorch their leaves. The Spider plant should be allowed to dry out between waterings, can be repotted in any season, and new plants can be started from their plantlets. They really enjoy and thrive in day temperatures between 65 – 75 degrees and night temperatures between 50 – 55 degrees. 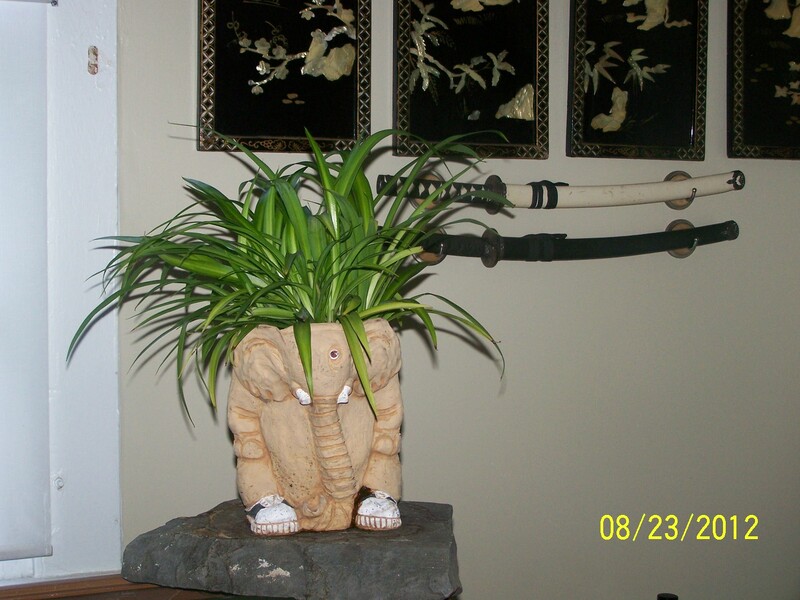 Spider plants are known as super eco-friendly, air purifiers. They add oxygen to the air as they remove formaldehyde. Mandaranum : A dwarf that grows approximately 4 to 6 inches and are dark green with a yellow stripe. Vittatum : Grows approximately 4 to 8 inches and are pale green with a white central stripe. Vagiegatum : Grows approximately 10 to 16 inches long and 1 inch wide, with white edged leaves. Did you know elephants perform death rituals? Sick elephants are cared for by herd members, bringing it food and helping to support him/her as it stands. In death, the herd will try to revive it with food and water for a while. Then herd will become very quiet when they really understand their herd mate is gone. The herd will then dig a shallow grave and cover the deceased elephant with dirt and branches, and will stay to guard the grave for days afterwards. Herd members close in relationship with the deceased peer can show signs of depression. Even herds that come across an unknown elephant that has died will show it similar respects. There are also reported cases of elephants burying dead humans they have found in this way.